InfraStruXure Central Standard scales up to 2,025 devices and 125 surveillance cameras. InfraStruXure Central enables an efficient way for organizations to monitor their company-wide multivendor physical infrastructure: power, cooling, security, and environment. This centralized repository of critical information can be accessed by multiple users from anywhere on the network, creating a consolidated view of the physical infrastructure. The platforms can grow with changing business needs through additional device licenses and add-on surveillance, capacity management and change management modules. 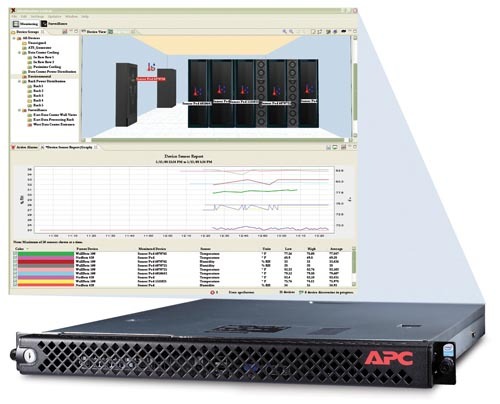 Capacity Manager add-on application Planning and optimizing actual power, cooling and rack capacities via shared data center model, enabling efficient equipment provisioning and right-sizing of your data center. Integrated data storage InfraStruXure Central ships with internal storage for data and video collection. Additional storage can easily be made available using the built-in Network Attached Storage server support for long-term storage and archiving. Centralized Management Simplify management of the physical infrastructure using a centralized repository accessible from anywhere on the network through a powerful and easy-to-use console application. Change Manager add-on application Easily track and execute moves, adds and changes of equipment in the data center via the shared data center model. Unified console Customizable Windows and Linux client application enables instant access to InfraStruXure Central application from anywhere on the network. Fault notification Real-time event notification minimizes response times to critical physical infrastructure situations. Enables IT Administrators to reduce mean time to repair, improve efficiency, and maximize uptime. Receive alerts via mobile phones (SMS), Web applications (HTTP Post), and e-mail. Fault notification Immediate visibility to your entire physical infrastructure through centralized, real-time device monitoring and notification enabling quick assessment of events as they occur. InfraStruXure Central Standard v5.0 scales up to 2,025 devices and 125 surveillance cameras. It supports capacity management up to 100 racks and change management up to 5,000 IT assets. InfraStruXure Central Standard Management Pack provides a complete, surveillance, environmental, and physical infrastructure monitoring solution. Includes: 2 NetBotz Rack Monitor 450, 2 NetBotz Camera Pod 160, 2 NetBotz Rack Sensor Pod 150, 1 NetBotz Dry Contact Cable - 15 ft. , 1 NetBotz Vibration Sensor - 12 ft. , 1 Beacon, 1 InfraStruXure® Central Standard appliance with 25-Node License, 1 InfraStruXure® Central Standard Software Support Contract. 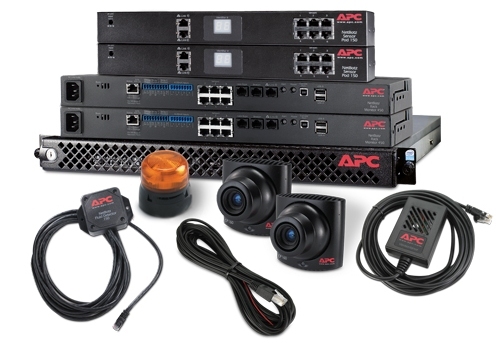 Download the APC NetBotz InfraStruXure Central DataSheet (PDF).